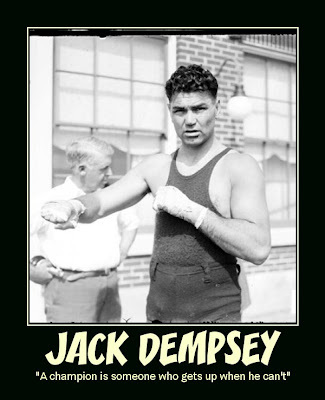 Today was the birthday of one of the greatest heavyweight champions of all time, William Harrison Dempsey better known as Jack Dempsey, he was born at the turn of the century June 24, 1895. 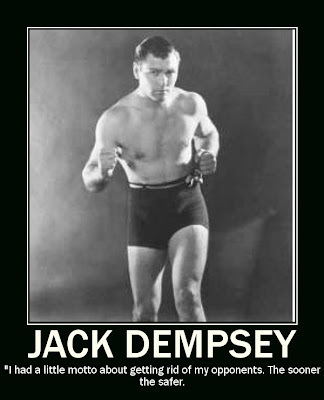 The west was still wild when he started to fight at the age of 15 against bigger and older opponents. 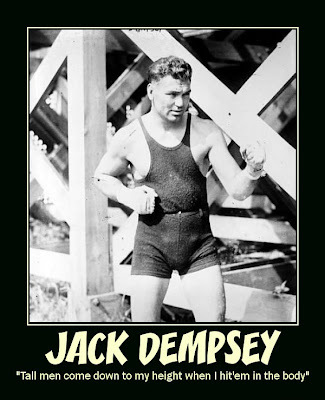 Between 1919 and 1926 Dempsey reigned as the heavyweight boxing champion of the world. 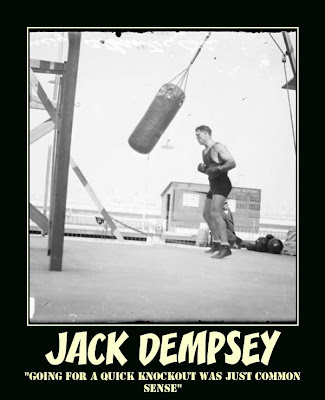 He could knock you out with either hand and was not ashamed to be called a slugger, men feared getting in the ring with him. 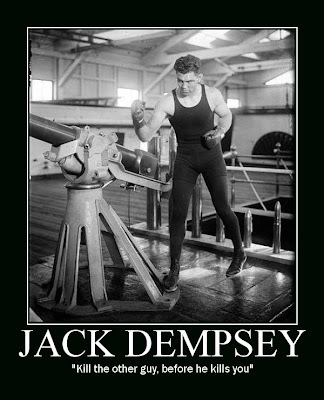 Above are a few quotes and pictures of the champ, enjoy. We've recently seen a spike in new student enrollments at the Muay Thai Academy International, a number of which have defected from Fairtex and Master Toddy. Others have a background in TKD & other sports oriented martial arts. Regardless of their respective backgrounds, they all tend to have one trait in common - they have the 'exchange' mentality. Almost all sports oriented martial arts teach students to always stand in front one's opponent. Body movement is much like that in fencing - get in, strike, and back out - but always be in front of your opponent. Whether we're doing shadow boxing, pad drills, or sparring: most new students want to strike and wait to counter, thus exchanging blows with their partners. If I'm in a fight, the last place I want to be is in front of my opponent trading punches. I've been trained to use continuous movement and react on the fly. Instead of simply blocking, I move in at angles to get myself close enough so its uncomfortable for him to attack. That's my comfort zone. If I don't move in, I'm trying to get behind him because, where else could you be safer than behind you enemy? Its really just a matter of your mindset. If you train to stay dynamic and reject the rule that states you have to stand still and absorb blows you'll find your movements more fluid and your sparring partners more frustrated. Hey everybody here is a multiple opponent fighting drill we use at Muay Thai Academy International. The object of the drill is to protect yourself as your training partners hit you with Thai pads, you can also use focus mits or gloves. Go for 1, 2, or 3 minute rounds. You don't need a cage to do the drill, just use a training mat or mark the floor with tape in a ten foot diameter circle and stay within the circle. This drill develops your defense, footwork, tactics and conditioning all at once, not to mention getting use to dealing with multiples and getting comfortable with impact to your body. So try the drill and let us know what you think, I know you'll get alot out of it.